Visit http://www.InsideTheMagic.net for more from Star Wars Weekends! 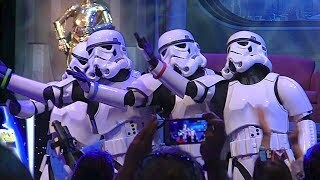 In the skit before the Stars of the Saga talk show at Star Wars Weekends 2014, Stormtroopers danced to their favorite playlists from Earth featuring today's popular songs like Let It Go from Frozen and What Does the Fox Say among many others. Jun 13, 2014 · Watch more 'Frozen' videos on Know Your Meme! ... "I Will Find You And I Will Kill You"
Stormtroopers sing "Let It Go" from Frozen in song medley at Star Wars ... Star Wars Weekends Stormtrooper Skit before "Stars of the Saga" 2014 w/ Song Medley, FROZEN. Frozen: Wrath of The Lich King - Let it Go.